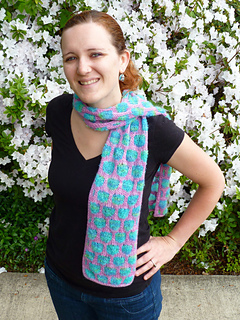 The shapes in this scarf remind me of lotus blossoms resting in a pond. It’s an incredibly light and airy fabric that feels as soft as flower petals. 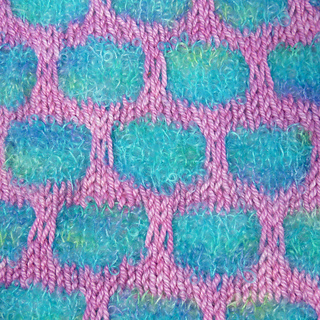 The color blocks are created using a slipped stitch method, so it is actually knit in stripes instead of blocks (it isn’t instarsia or fair isles), but Intarsia is used along the outside edges of the pattern. The I-Cord edging is knit on afterwards and prevents the edges from curing in. The boucle yarn that the pattern was originally written in, Fleece Artist Kiss Curls, has been discontinued- but a new option, Fleece Artist Goldilocks, is a perfect substitution.